The third of three Veneno models captured in Hong Kong en route to Macau. 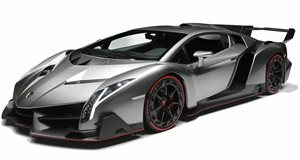 Lamborghini built just four examples of the Veneno: one for itself, and just three for customers. The first Veneno, with red accents, went to Antoine Dominic, owner of Lamborghini Long Island. The second went to Kris Singh, whose 4-million-dollar 750-hp masterpiece was delivered with green accents. Trimmed with white accents and completing the Italian Tricolore, the third model has been caught in Hong Kong en route to Macau where its new owner presumably resides. Thanks to David Siu and Chester Ng for the pictures.